"Entertainment Tonight" correspondent and special Early Show contributor Vanessa Minnillo was backstage and on the red carpet of the Grammys, where she was able to pick some of the winners' brains about what it feels like to receive the music industry's highest honor. Minnillo talked to Beyoncé Knowles, whose album, "B'Day" won for Best Contemporary R&B Album. It is her 10th Grammy. "It means all the hard work is paying off," she said. "I know the Grammys is something that it's so respected and not everyone gets chance to perform on that stage. After all the years we have been performing to still get this honor, it's amazing." For rocker John Mayer, he said he would still rather do a great performance than win an award. Before he went on stage, he told Minnillo that he is "honed in on making that happen tonight." Mary J. Blige said she was proud to be honored by her peers. 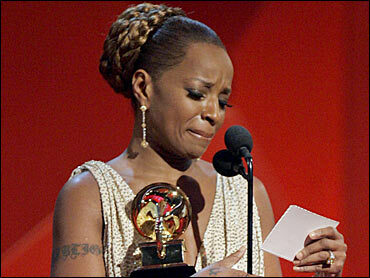 She won a Grammy for Best Female R&B Vocal Performance, Best R&B Song and Best R&B Album for "The Breakthrough." "I didn't know so many people even cared like that," she said. "I am just humbled by the whole situation and I am happy and excited and I just want to have fun." Oscar-winner Jamie Foxx, who was nominated for a Grammy for Best R&B Album for "Unpredictable," said he was humbled to be in the company of greatness like Blige. "It's absolutely incredible," he said. "I am just a puppet, starting out. I will lay back and enjoy it." "American Idol" season four winner Carrie Underwood, who won a Grammy for best new artist and for best female country vocal performance for "Jesus Take the Wheel," said the Grammys were a great time for artists to shine. "I love singing in concert and I love all kinds of music," she said. "It's awesome everybody can get together for one night and have a great time and show off what they've got." Singer John Legend won a Grammy for Best Male R&B Vocal Performance and for Best R&B Performance by a Duo or Group. "In three years, I have already got five Grammys," he said. "I am evil now. I don't talk to anybody. I have my body guard tell people, 'John doesn't talk.' "